Years ago I was in a gallery show with Mineko Grimmer, who makes sound sculptures of pebbles frozen in ice. 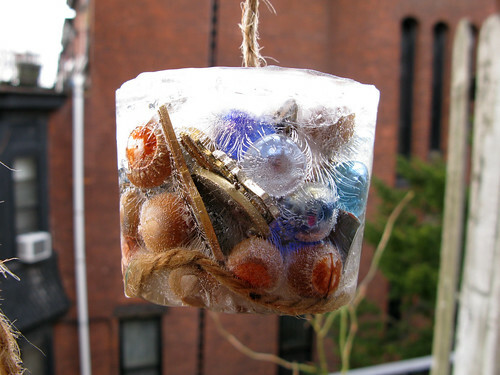 As the ice melts, the pebbles drop into a pool or a wooden lattice and make irregular sounds. 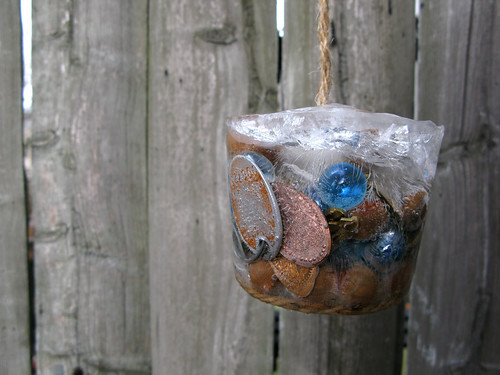 I made my own version entirely out of things from my junk drawer: marbles, squashed pennies, old keys and dog tags, and some acorns I was saving in a tiny jar. What does it sound like? I won’t find out until the weather warms up. 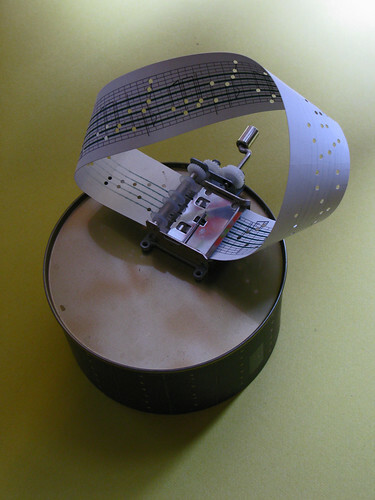 Many thanks to Thing-a-Day for inspiring the instrument-a-day project for the second year in a row! This one didn’t really work out. 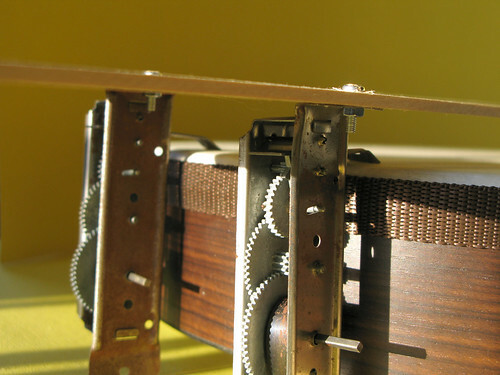 It was supposed to be a sequel to last year’s automatic tension guitar, but it doesn’t work or sound nearly as good. I’m experimenting with cheap substitutes for the little clapper solenoids I used last year, which are now really hard to find, but so far the results are bad. And it’s not even automatic! I didn’t get around to rigging up a computer interface, so I’m playing it with the funny little wooden keyboard you can see at the upper right. It sounds like this. 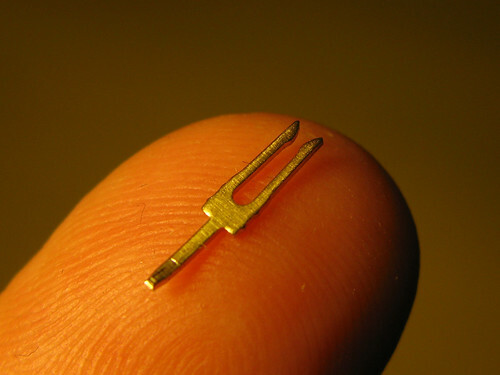 Very very tiny. I clamped it in steel pliers so I could use a magnetic pickup to record the sound it made. Slowed down by a factor of eight (down three octaves), it sounds like this. I’m performing at Barbes in Park Slope, Brooklyn this Wednesday (March 4th) at 8pm. 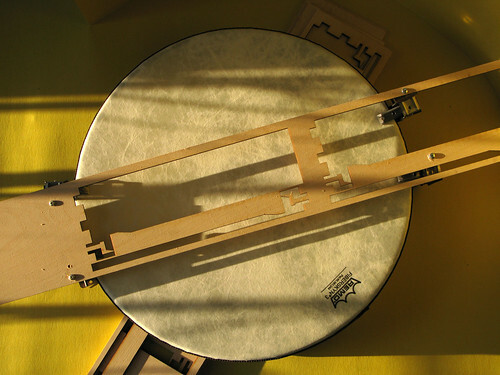 Come at 7 and mess around with homemade instruments – bring your own if you like! 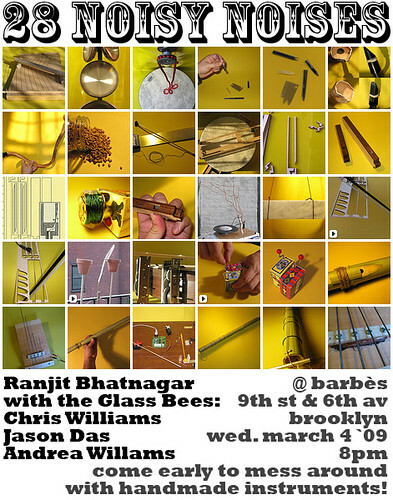 I’ll be joined by The Glass Bees. 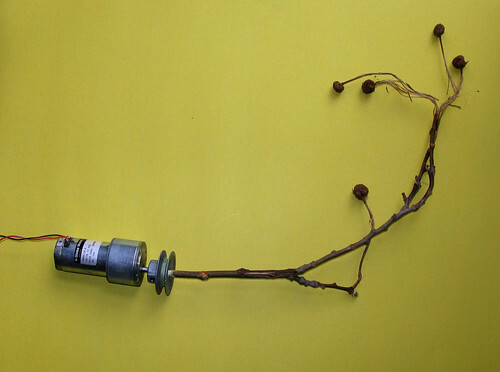 I found this arboreal flail in a mud puddle in the park, so I glued it to a motor. It keeps the beat pretty well, until it falls apart. It’s a familiar tune played upside-down and backwards, and then just backwards, and then upside-down and backwards again. Over and over, forever. Tower of pot & pan lids wired to an old floor lamp. Yes, I buy my cookware according to its sound; don’t you? 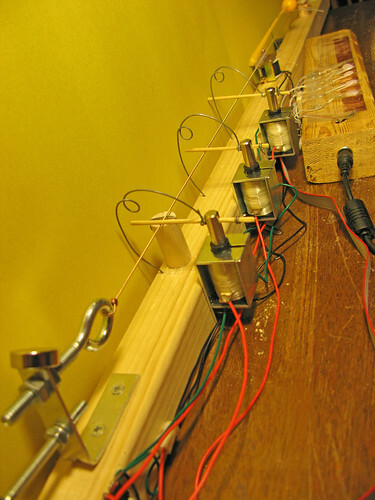 Good old-fashioned circuit-bending with a baby-rattling device I found in the trash and slightly modified. 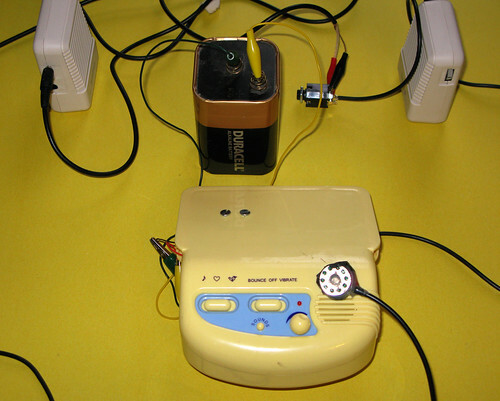 Magnetic pickup and contact microphone pick up sound in two different ways. 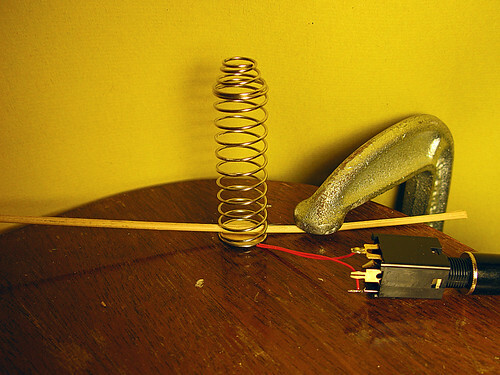 Spring, clamp, bamboo skewer, and piezo contact microphone. 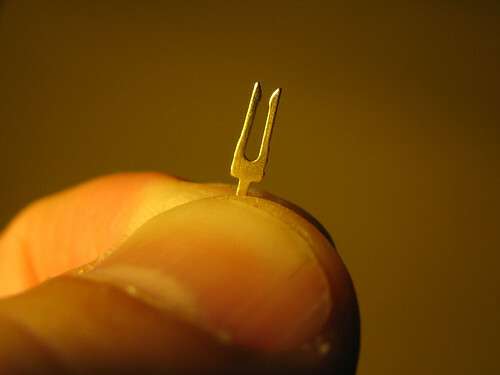 Finger pressure on the skewer changes the tone. It goes sproooooinnnnnnng!